The field of cornflower yellow is a scarf at the neck of the copper sunburned woman, the mother of the year, the taker of seeds. The northwest wind comes and the yellow is torn full of holes, new beautiful things come in the first spit of snow on the northwest wind, and the old things go, not one lasts. For me, this fall has been a season of false starts. Fall itself has been slow to get here and I’ve also been feeling like I’m always starting something only to abandon it a few days later. I started reading Skylark back in September; twenty pages in, I had to abandon ship.The same thing happened with The Art of Fielding and Jiro Dreams of Sushi–and with zumba. After one class, there was no more time for Friday afternoon exercise. It’s not for lack of interest, either. I would happily do all of these things (and more) each and every day, but teaching this semester has been a bit of a struggle and the project deadlines keep appearing, one after the other. Really, the only tasks that seem to be completed are those that end up on my kitchen table. I suppose there’s something reassuring, however, about the fact that I haven’t sacrificed eating for academia. It’s all about preserving small traces of humanity. This past weekend, as I sat at home trying to grade papers and coughing incessantly, I found myself craving something sweet. But given my obligations and unhealthy state, I wasn’t really sure that I should embark on any culinary adventures. I instead decided to do the wise thing and satisfy my longing by looking up a few of the cookbooks I’d had my eye on recently (you know, for the sake of compiling an adequate Christmas list). As I mentioned in my last post, I was feeling quite covetous of The Moro Cookbook, so I started with it. One of the first things that popped up was an article by Nigel Slater in The Observer that offered several recipes from the book. 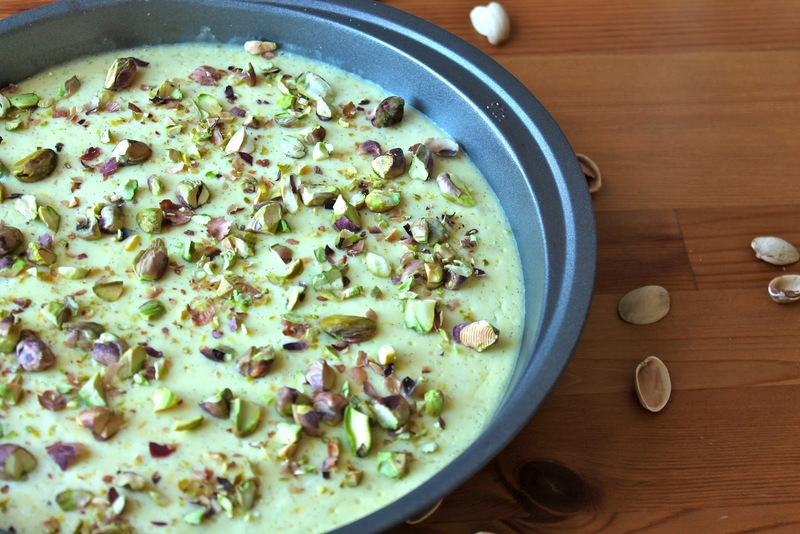 Skimming the article, I was simply enjoying the various possibilities: clams, paella, lamb stuffed with saffron rice…And then, at the end of the article, my eyes fell upon it: a recipe for a Lebanese yogurt cake with pistachios. To put it mildly, nothing gets my heart beating faster than a dessert featuring these little greenish nuts. What made the dessert all the more compelling for me was the small fact that it would help me to use up an unfortunate container of Greek yogurt (Nancy’s Probiotic Greek Yogurt) that I had bought in an adventurous mood, hoping that it would be as good as Nancy’s other yogurts (as the Greek wisely pointed out after one spoonful: “There’s only one Greek yogurt and it’s Fage.” I don’t have much brand loyalty, but, on this matter, I tend to agree). Given my complete dismissal of the product, I will, however, say this for Nancy’s Greek Yogurt: even if inedible on its own or with fruit, it made for a perfectly lovely yogurt cake. Lemon juice and zest, as well as vanilla bean and sugar, can go quite a long way to improving flavor. And fortunately for me, considering I wasn’t feeling all that well, the cake (I use this term loosely; the dessert is really more of a fluffy custard, spongy and wonderful: a yogurty equivalent of cheesecake) was easy to assemble. The most difficult things–if we can even call them difficult–were scraping the vanilla seeds out of the pods, whisking the egg whites until soft peaks formed and then folding them into the yogurt mixture. Truly, this cake is so simple to make and so rewarding that it’s is now going to become my “random sweet tooth craving” solution. Let’s just say that I’ve always had a soft spot for lemony custard. Simplicity suits this dessert. As I was making it, I was tempted to add a splash of either rose or orange blossom water, or maybe to replace some of the vanilla with cardamom. 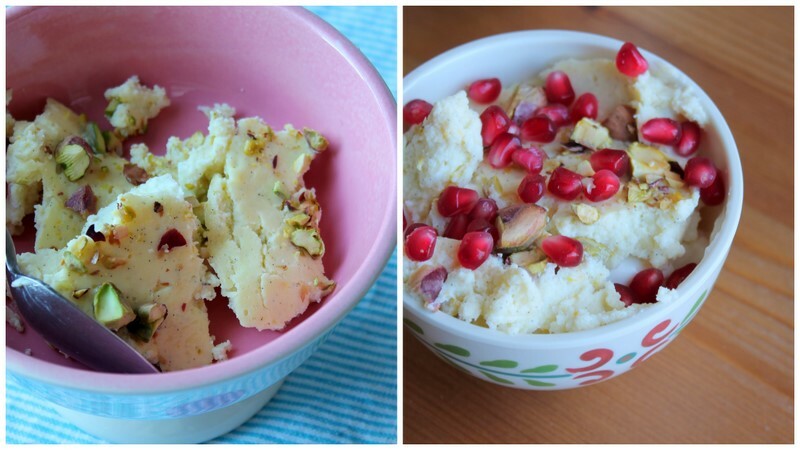 And, while I resisted the impulse (sometimes, all the heart wants is good old-fashioned vanilla and lemon), I do think that these things would work well, especially with the toasted pistachio topping. On a similar note, I’ll also admit that I was initially wary of the suggestion to serve the yogurt cake with more yogurt (it seemed a little excessive to me, so my first taste of the dessert was the purist’s version), but I have to admit that, when I tried it during my second serving, the combination exceeded my expectations. Somehow, the spongy sweet bits of cake tasted even better when combined with the plain tartness of Greek yogurt. 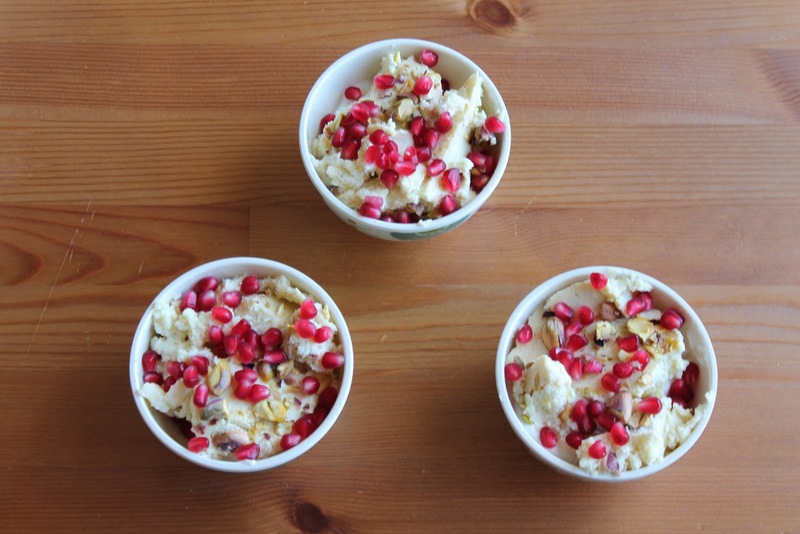 Either way, I think a sprinkling of extra tart pomegranate seeds adds a nice dash of color to both an already flavorful dessert and an otherwise mundane Saturday afternoon. This was definitely a project worth completing. A few things about this recipe: As much as I liked the cake itself, I was somewhat baffled by the recipe in The Observer. In his article, Nigel Slater suggested that if you don’t have homemade yogurt, you might want to add a little milk to thin it out. I wasn’t quite sure what this final product should look like, so I used 300 grams Greek yogurt and 50 grams milk (weighing everything out on my kitchen scale). I was then worried that I had perhaps added too much milk and that the mixture was perhaps too runny, so I added an additional 10 grams of flour (original suggestion: 20 grams; my suggestion: 30 grams, particularly if you combine milk and yogurt). There was also missing information about how much sugar to add to the egg yolks, but I decided to split it evenly: adding 50 grams to the egg yolks and then 50 grams to the egg whites (I used, in total, 100 grams of sugar, which was again more than 70 grams the original recipe suggested). I also left out the suggested orange zest and juice and didn’t find that I missed it at all. My apologies for listing the ingredients according to the metric system, but, considering Moro is a British restaurant and I have, in recent months, really grown attached to my kitchen scale, this is the system I used while making the recipe. -Preheat the oven to 350 F (180 C) and have a 9-inch round cake pan ready (you can line it with parchment paper if you’re planning on removing the cake from the pan in its entirety; I simply cut slices and arranged them in bowls). -While the oven is heating, whisk the egg yolks with 50 grams of sugar in a medium-sized bowl until light yellow and thickened. -Add the vanilla seeds and mix together. 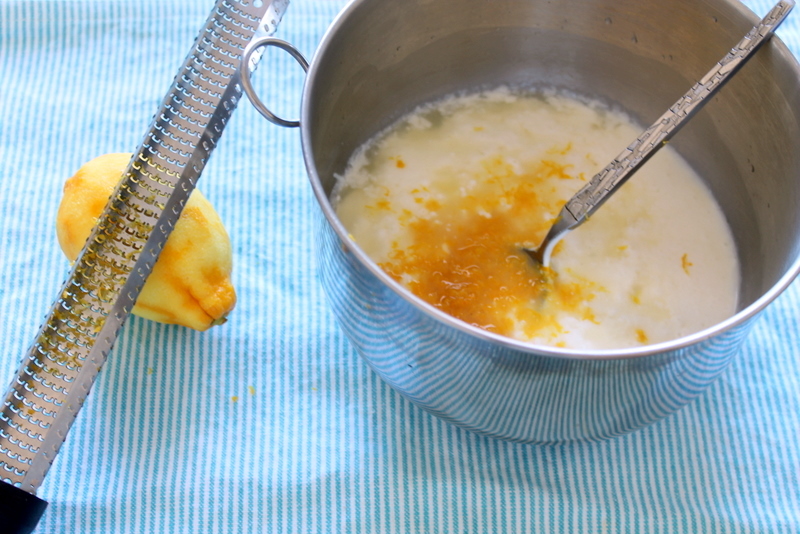 -Then, whisk in the yogurt, lemon zest and juice and the flour. Mix well. -In a small bowl, whisk the egg whites with the remaining 50 grams of sugar until soft peaks form. 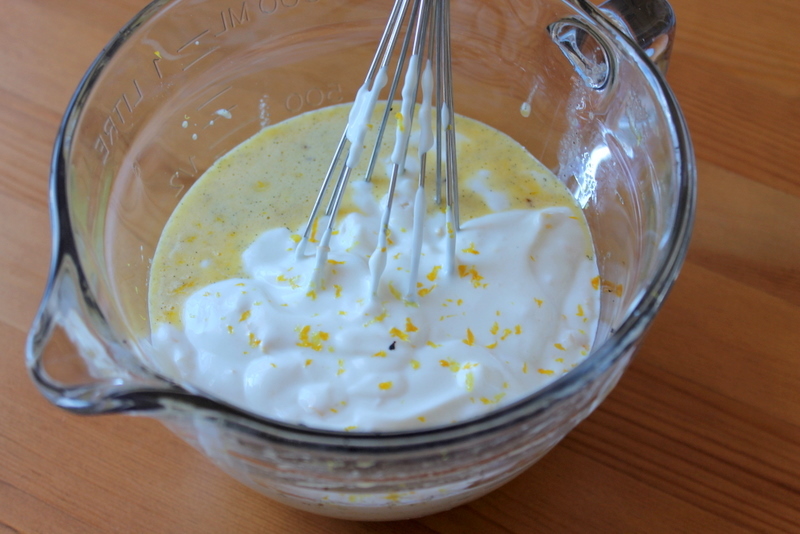 -Fold the egg whites into the yogurt mixture, making sure to combine them evenly. -Pour the mixture into the cake pan. -Before putting the cake in the oven, prepare a water bath with boiling water (or have the water heating in the oven as your prepare the cake mixture). -Place the cake pan in the water bath (the water should come about halfway up the pan) and bake for about 20 minutes. 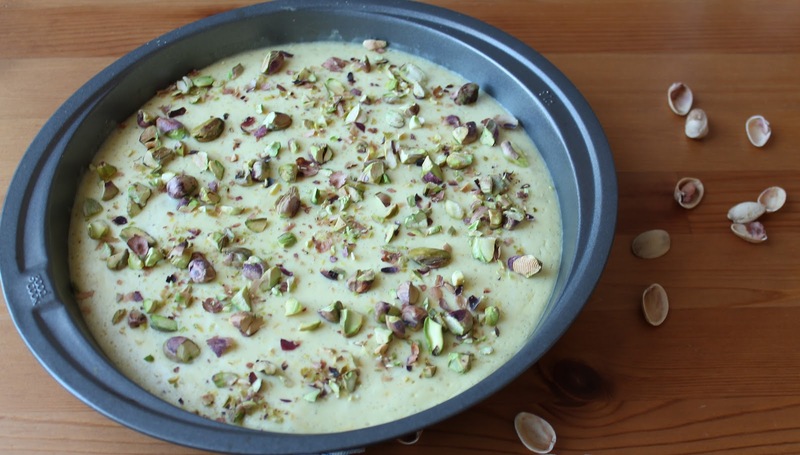 -After 20 minutes, gently sprinkle the chopped pistachios on top of the cake. -Bake for an additional 20 minutes or until the cake has lightly browned. -Serve on its own or with yogurt and fruit. Goodness! Another Moro recipe that I had never even seen — even though I've been a happy owner of the Moro Cookbook for over five years! Looks lovely and I love the jaunty dash of color from the pomegranate seeds. Oh, wow! Creamy, custardy things with citrus zest are my favorite, and I'm addicted to my awesome kitchen scale, too — so I think I might take a stab at this. And the pistachios — mmm! Thanks for sharing. Kitchen scales are definitely the best; I've become so addicted to it that I no longer measure a cup of flour…I've memorized the weight of all-purpose and I find that it saves so much time! As for this yogurt case, it was my pleasure to share! If you end up making it, I really hope you like it! Personally, I don't think I let mine brown nearly as much as I should have (I suppose I was aiming for a softer texture), but I'm sure there will be a round two and future experimentation.